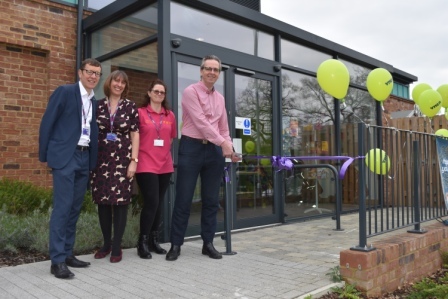 The eagerly awaited opening of YMCA East Surrey’s YMCA Merstham Hub Pre-School took place on Thursday 28th March. Reigate and Banstead Borough Councillor, Mark Brunt, who has been instrumental in the development of the project, cut the ribbon. The YMCA Merstham Hub Pre-School, based at Portland Drive, will offer high quality and affordable childcare for up to 40 children aged 2-5 years. It is YMCA East Surrey’s second Pre-School in Surrey, with the first one opening in 2016 at the Sovereign Centre in Reigate. Ten children have been enrolled so far and will start at the Pre-School on Monday 1st April. Merstham is an area with a diverse mix of families and cultures and has pockets of socio-economic deprivation despite being in the commuter belt. There are a high proportion of families eligible for FEET funding which is the Free Early Education funding for 2-year olds and priority for Pre-School admissions will be given to families facing disadvantage. Sixty-five children attended the YMCA Sovereign Pre-School last year. In addition, over past year, YMCA East Surrey has provided 41,492 hours of short break care for families with children who have disabilities, plus school holiday places for 755 children and after school care for 380 children. Already, the project has benefited from links with other charities, trusts and organisations. YMCA East Surrey would particularly like to thank Stripey Stork, who donated the equivalent of £2,000 of equipment, and the Merstham Millennium Trust who gave £1,000 to help enhance the outside area. 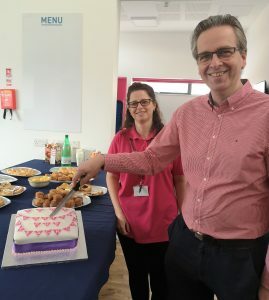 Merstham Community Facility Trust have also been supportive and additional funding has come from Reigate and Banstead Borough Council and Surrey County Council. It took more than 10 years for the concept of the Merstham Community Hub to come to fruition and work on the development of the YMCA Merstham Pre-School began in 2017. Anyone wishing to enquire about a Pre-School place can email Teri at teri.morris@ymcaeastsurrey.org.uk or telephone 07732 602999.